The corridor of Telegraph Avenue in Oakland known as the Temescal District used to be the go-to for an unlikely trio: Ethiopian food, paint and stamps. But since the late 1990s, an influx of young families and hipsters fleeing San Francisco’s unaffordable real estate prices has transformed the vibe from utility to upscale. Crowds wait curbside for tables at top restaurants, while couples of all stripes snack on organic sorbet. Along a string of ’20s alleyways, garages and stables were recently converted by a developer into charming shops offering mid-century furniture, indie fashions and specialty foods. Many are now under renovation by a cohort of young proprietors. 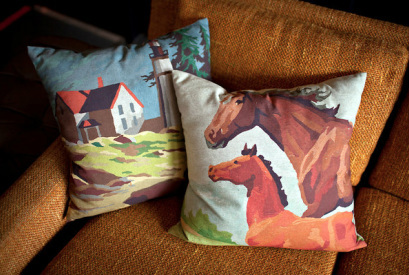 One of the first to anchor the alleyway, Lot 49 is a well-curated, reasonably priced store with ’50s- and ’60s-style furniture, and vintage-inspired art and gifts, like pillows with a paint-by-numbers theme from $65. 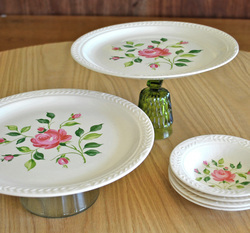 Lot 49: "My prices are not San Francisco prices," says chatty owner Perry Lucina of his collection of estate-sale, thrift and salvage treasures. "People ask, 'Why is it so cheap? Why is it so cheap?' " The answer? "I like to keep things fresh." A veteran of Temescal Alley of two years, Lucina opened the home and design space in the former architect's office space as a pop-up - and as a way to thin his personal collection of midcentury modern chairs - but he was persuaded to stay thanks to the welcome he has received from Oaklanders determined to shop locally. Some San Franciscans are even catching on, lured by the down-to-earth prices. Ogle the pristine '60s-era Googie-friendly lamps, "The Ice Storm"-style array of colored glassware and the handsome dark-wood mini-bar that could easily slip into Don Draper's bachelor pad. Maybe it's creativity on a budget, maybe it's a wish for one-of-a-kind style, maybe it's even redemption. Whatever the motivation, "upcycling" is hot - especially in Oakland, where retail boutiques specializing in housewares made from items diverted from landfills have sprung up like daffodils. According the book "Cradle to Cradle: Remaking the Way We Make Things" by William McDonough and Michael Braungart (North Point Press; 2002), upcycling is "the practice of taking something that is disposable and transforming it into something of greater use and value." This sort of creative reuse differs from recycling because it requires less in the way of energy to transform the original object. According to the Department of Resources Recycling and Recovery (CalRecycle), which oversees the proper disposal of the 92 million tons of waste generated in California each year, "Reuse is preferred to recycling because reuse consumes less energy and less resources than recycling." The upcycling definition is not without controversy. Is a side table made of an old phone book and stacked soda bottles more or less valuable than its original parts, recycled? That probably depends on the artist. But what is clear is that the awareness of upcycling is on the rise, and so is the quality of goods available, as artists and designers turn their imaginations loose on the millions of tons of waste we create each year. Perry Lucina has a thing for chairs. The graphic designer-turned-proprietor of Lot 49 in Oakland's Temescal neighborhood says, "I've always been drawn to the colors, patterns and textures in old chairs - my garage was full of them!" In February, Lucina finally had a place to showcase the chairs he'd transformed through elbow grease and eye-popping, color-drenched fabrics: His tiny store, which carries a mix of upcycled goods, cleaned-up furniture and work from local artists. Among the items in the store are jewel-toned pillows sewn from fabric scraps, which Lucina cuts and has an Oakland seamstress sew for him, for $45. 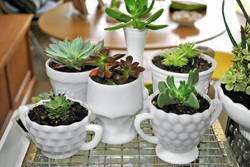 Old milk glass vases hold succulent plants in simple but eye-catching arrangements. Lucina's newest reclamation experiment is cake plates, made from tag sale dinner plates attached to inverted green water goblets. 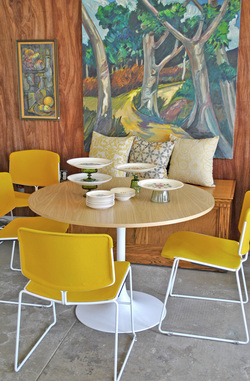 And yes, there are chairs: A set of four 1970s-era chairs in lemon yellow are cleaned up and clustered around a tulip table that Lucina found and outfitted with a new white oak top. Another set of Danish modern chairs waits to be claimed by the customer who bought them. "I was going to reupholster them, but the guy is taking an upholstery class himself and wants them to be his first project," Lucina says, obviously tickled that the mantra of "fix it up, don't throw it out" is being spread to his clientele.